Latest update: 19 Jun 2018. Version: 2.6.2. Platform: for Wordpress. Have you wondered how many steps you need to do for adding an image into a wordpress post? For example, a screen snapshot? Or a region from Photoshop? Or a photo somewhere on your hard disk? 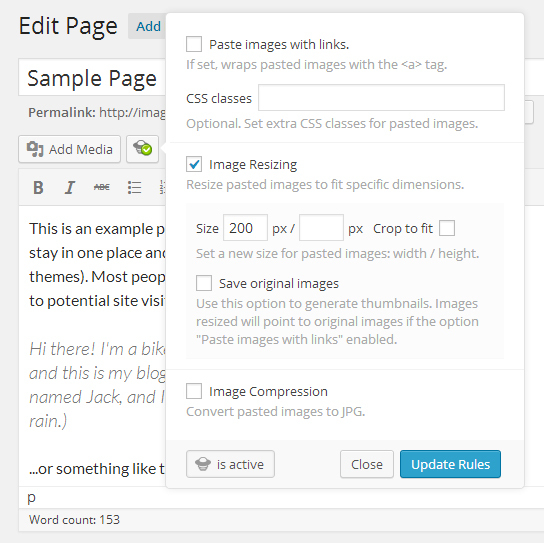 Image Elevator for Wordpress allows you to paste images into the post editor directly from clipboard! In other words, you can paste images directly from your favorite graphical editors or from any screen capture programs. Just copy & paste. What’s more you can rename and compress images after pasting. If you write tutorial articles illustrated with screenshots, you know that making, processing, saving, uploading all these screenshots take a lot of time. 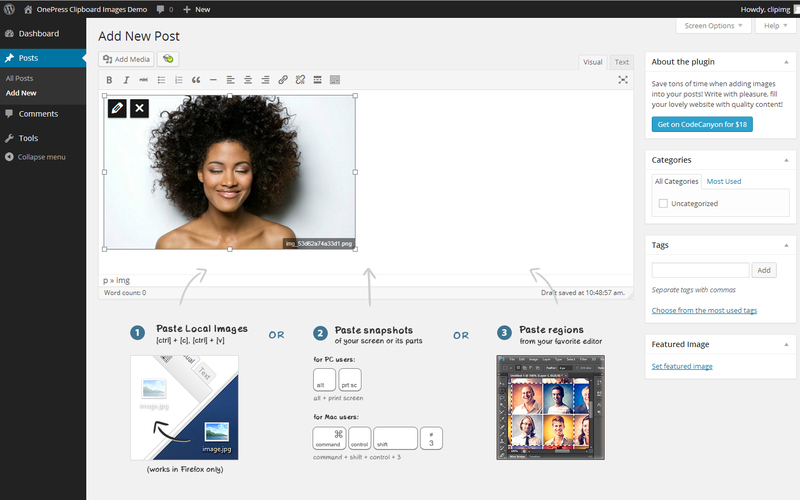 With Image Elevator, you can make screenshots and paste them directly into the post editor in just matter of seconds! We recommend you to use one of the following great programs which allow to make screenshots of the entire screen or a portion of the screen, edit and then copy them in clipboard: Jing, TinyTake, pixclip, Skitch, OneNote. Also by default operating systems provide users with some abilities to capture the screen. If you often process images with a graphical editor before publishing them on your blog, Image Elevator will save you tons of time. Remember which steps you need to do in order to add images to your posts after editing in a graphical editor: selecting a folder to save (1), typing a title (2), saving (3), opening the WP Media Library (4), selecting the folder where you have just saved image again (5), uploading (6). With Image Elevator, you only need to select a region (1), copy & paste (2). All the most popular web browsers allow to copy selected images from a webpage into clipboard. Then you can paste them into your post by using Image Elevator. Please keep in mind the images in internet may be subject to copyright. Firefox provides access to files, copied from the explorer, for web applications like Image Elevator. It’s the quickest way to add images from your PC into your posts. Just call the context menu for the image you want to copy and select the item “Copy”. Then insert the image in the post editor. You can use Image Elevator to paste images in the Text Mode as well as the Visual Mode. By default Wordpress doesn’t allow to change file names of the images in your posts. But the relevant filename of an image is good for SEO as well as the relevant headline. Also if you paste an image from clipboard, it has a random name. Therefore we included a handy tool for renaming any images on your server. When you paste images, especially photos, they can be quite large and add extra loads on your website. Turn on the compression feature, set the max allowed size for pasted images and forget about this problem. Your images will be automatically converted to jpeg with specified the quality value. The most of the plugin features are available in all the major browsers (Chrome, Firefox, IE 11). Pasting local images stored on PC via clipboard is available in Firefox only. FIXED: A set of bugs. FIXED: The Image Elevator dialog was overlapped by the TinyMCE toolbar in WP 4.0. FIXED: ‘Fatal error: Call to undefined function mdir()’. 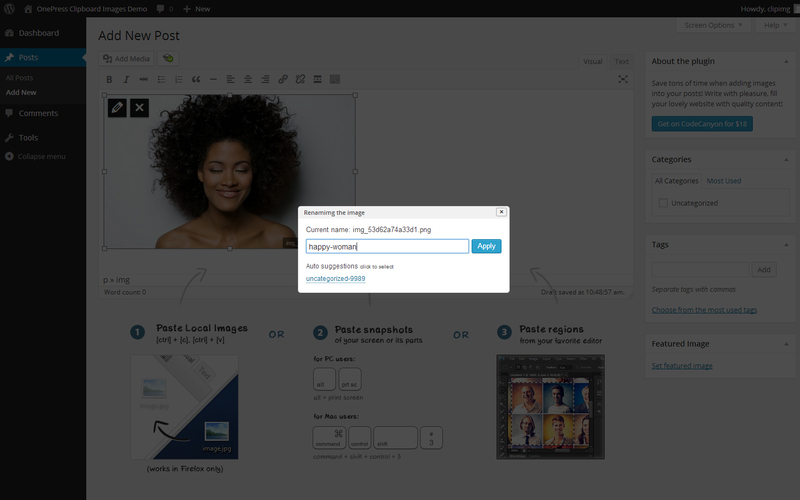 NEW: The option to resize pasted images on the fly. NEW: The plugin automatically adds the support for pasting images from clipboard for all wp editors on any page (including editors of content builder plugins). FIXED: The renaming feature (the plugin has not updated the title of the image in the Media Library). REMOVED: The drag & drop feature (obsoleted). FIXED: The “undefined function factory_filename_without_ext” bug. Important: We have updated our server API. Please re-verify your license key after downloading the update, otherwise the plugin will not work. NEW: We have updated our API to make the plugins more better by providing more linked services in future. We tried to make it smoothly and many people even will not notice it. Important: Recommend to re-verify your license key after updating. Please read this note. FIXED: The bug of incorrect processing empty images that are pasted from Photoshop. NEW: Common improvements of performance. FIXED: The bug in the Media Library after renaming images. The plugin was renamed to OnePress Image Elevator. Don’t forget to activate the plugin again after auto updating! NEW: An ability of renaming images on the server directly in the post editor. NEW: An ability of compressing images pasted from clipboard on the fly. NEW: Settings page was added for configuring the plugin. FIXED: The bug of pasting html tags in the latest version of FireFox when the plugin is activated. We have added the most wanted feature, the ability to drag & drop local images from your computer directly into the post editor! It extends the list of the supported browsers. Now the following browsers can be used: Chrome, Firefox, Safari, IE10, Opera.